Ooooh, now this I simply /must/ see. I'll try it out as soon as I get home and let you know what I think of it. Cool beans. Granted it's not balanced or anything, but I kinda like how it turned out. 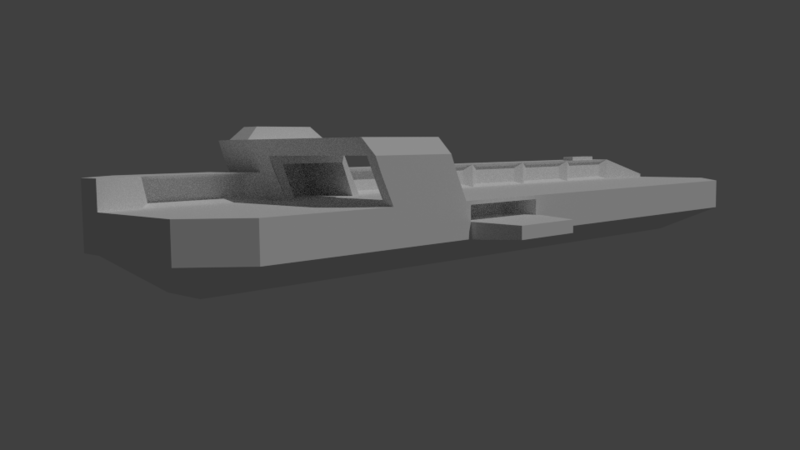 I realized after I thought about it that to represent drones... you could just use an existing ship model and scale them down. So currently that bay launches tiny little Avalanche clones that spit missiles. They look hilarious when you get like 6 going at once, too. I even figured I'd go for a bit of realism, so after you fire them (their launch sequence) they have no arming or tracking and just fly straight out. On ships with fixed missile points like the new missile cruiser it looks pretty decent; not so much on ships with twistable launchers. Oh? I would think that, realistically....drones should be able to track their target, shouldn't they? And if it doesn't look very well on ships with twistable launchers...then couldn't you restrict them to ships with only fixed launchers? Something like....find every hull with fixed missile mounts and give them an effect called "fixed_mounts:true"
Then have the CRB-X1 require "Fixed Missile Mounts:OK"
Actually, couldn't you actually make it so that equipping the weapon applies an effect that reduces tracking angle to 0? a) Weapons can apply effects on equip that modify the hull. Now, if that won't work. I'm almost certain you could do it with a booster. Then set the CRB-X1 to require "Allow Drones: OK"
It seems like it would be possible, and might actually help with balancing. ie: In order to launch drones, you have to downgrade your weapon mounts to fixed hardpoints. Which seems like a fair drawback as you'll be relying primarily on drones as your weapons anyways. Well, realistically you'd want them to be limited to carrier-based hulls anyway... so it'd probably be easiest to just set that attribute on the hull and have it check, anyway. Even with fixed-mount launchers they still look a little odd, so for an actual dedicated carrier you'd want to alter the model a bit to put the physical bay on it. As for tracking drones, it depends on how you handle them. I did it the easy way I mentioned and just made them projectiles of the launcher that then fire scattering submunions at regular intervals. With a situation like that, they're always going to rely on your targeting, so with the way I have them in now they fly out straight for two seconds like doing a launch sequence and -then- start tracking your current locked target. The missiles they fire also will track your lock. In order to get them to pick their own targets, though, you'd have to go the device-and-script route that BeLugh mentioned, so far as I know, and actually spawn the drones as NPCs with their own AI prioritizing. (And devices with abilities to control their target, ect) This is more of a slow, constant-ticking missile attack that can be shot down. It bears mentioning, though, that if you lose YOUR lock your drones (and their missiles) will also go dumb... but will start tracking again if you reacquire lock, even if they are already mid-flight. Since you gave a picture of the battleship from RA3 the other day (Yamato, right?) it bears mentioning that these drones strongly resemble the Allies' carrier attack from that game; pick a target and they will engage that target, but very limited AI when not directly aimed via locking. Edit: Just confirmed, and changed it for the next patch: you can put skill additions on hulls (or any other equipment) and while they won't show on the Skills page under the list of effects, they do still work. So in the next patch released, only ships like the refit for the Orca and Aurora, with fixed launchers, will have drone=OK. True, that seems like the best overall solution...very very good as a "proof of concept" weapon. Oh, that's fine then. From the way you worded your post, I was under the impression that they had no tracking at all and just flew in a straight line. The way you just described it is perfect for drones. Maybe something like that for the future, but for now....as a proof of concept, they already work very well. No, the Shogun Battleship. The Yamato was the Battlecruiser from Starcraft. The Shogun battleship was the basis for my battleship design, wheras the Yamato cannon from the Battlecruiser in Starcraft greatly resembles the mining laser on my Planetcracker. it bears mentioning that these drones strongly resemble the Allies' carrier attack from that game; pick a target and they will engage that target, but very limited AI when not directly aimed via locking. I see, yes...that's a very apt analogy. My general train of thought was to make the size-IIs launch bombers, then, with a fair bit more DPS but slower and having to get in closer... and then the size-III launchers do a pair, bomber and interceptor together, but on a longer cooldown to keep balance in line. So it'd be something like one bomber or interceptor every two seconds or a pair every three seconds. Bombers would have the additional advantage of having a higher damage/shot and thus being more effective vs. armor. 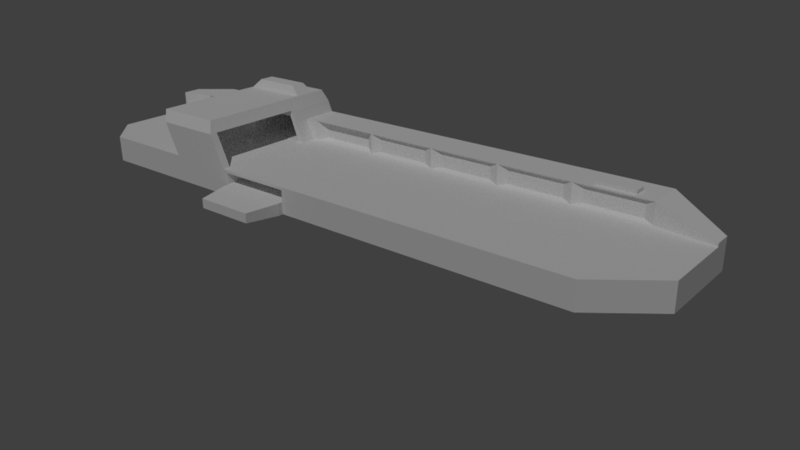 Though I don't know what model I would use for the mini-bombers; crab, maybe, or even the cargo ship. And ah, that's right, Shogun Battleship. It's been a while since I played any RA3, and most of what I remember fondly is the Russian man-cannon. The comparison to the carriers just hit me afterward, but they were almost the same. I suppose the Fusion Ray has passing similarities with the Void Rays from SC2 as well, with the way the beams build up over time. When you get a chance to try them out, let me know what you think about balance. Numbers like speed, damage and tracking are easily modified. (I already halved the duration on the interceptor missiles locally, they are way too potent at the 4-second duration in the build.) I was trying to strike a balance between them being able to actually track a target and look like they were approaching while keeping them slow enough to be able to fire all missiles. This is officially the best thing ever. I just loaded four of them on to my ship and started shooting them, I was laughing maniacally from the moment the first one launched until every enemy in my solar system had been decimated. Now you know what we need? Carriers, that fire mini-carriers...which fire drones! In seriousness though. Would it be possible to tweak the lifespan of the drones so that they last a lot longer, but increase the ammo capacity so that you can have a lot of them while also lowering the amount of damage the actual missiles do? It feels like, to me...drones should be something that pretty much just continuously follow their target unless they kamikaze it or you lose your target lock. Right now, it just seems like they do too much damage too quickly, whereas I would rather see them as being like....a constant harassment, slowly whittling your health down while preventing your shields from recharging. I haven't been on the receiving end of them yet, but it just seems like they'd be almost impossible to actually defeat. I would think that, ideally...when facing drones, you could either move away to force them to lose lock....or move in close, tank the damage and out-dps the actual main body of the Carrier before the weak but continuous damage of the drones does you in. When I was playing just then, the playstyle I was using felt far too similar to the same playstyle I always use with any missile carrier. So a drone carrier should be tweaked a bit to give it a different feel and playstyle. Just my two cents, though...and I can't stress enough how effin awesome this is as a proof of concept. Seems I have a bug to report. This is a bit of an odd one, to be honest. I was using the Experimental Hephaestus Hull, with two energy torpedoes and one CRB-X1. Energy torpedoes were working great for a quite a long time, then.....all of a sudden...I noticed that they weren't doing any damage to Boomerang hulls or shields. So I started destroying those with the drones, and kept playing. A little while later, they stopped dealing damage to Avalanche hulls, then Fang hulls etc. etc. Until they weren't dealing any damage to anything. I can upload a log file if you point me to where I should look. Actually I think that's a known bug not just in the mod but in the game, but seemingly hard to reproduce reliably. I saw someone else had mentioned it as well in bug reports, where ships just stop taking damage except possibly from explosives (probably because of the AOE nature). As to the rest, I'll look into those tweaks. I mean, it's always going to be -similar- to flying a missileboat; the major different at the end will be that the fighter bay will allow a person to do better theoretical damage over time, whereas the missiles give a nice big boom up front. I can stress this a bit more, though, by upping the duration as mentioned. Damage will be tougher to work with, though; right now they're set to 20 damage per missile and going much lower than that will make them all but useless at high hull levels. What I can do to keep it balanced, though, is increase the life of the fighters and just spread the missiles out over the lifetime. So instead of firing a rocket every half-second they fire every second. Less DPS from the start but the same overall damage over the course of the fighter's life. Also, I got the bombers done last night, and they seem to work nicely as well. Also played around with other various settings to sometimes-hillarious effect that I might share in the next patch as well. My favorite are the actual superiority fighters that I made; they launch in groups of five and actually launch in a small formation using direction but no spread, turn after about a second to engage your locked target, then strafe it with autocannons before trying to suicide into the enemy hull. Turns it into more of a direct weapon (opposite what was mentioned previous) but the visual effects were actually pretty cool. I know of a bug where, you can get the shields down, but then the hull stops taking damage and you have to let the shields regen a bit...and it seems to happen randomly. However, this seems a bit different, as it does 0 damage to either the shields or the hull and happens every single time. It's possible the two bugs are related, but they don't seem /that/ similar. I wouldn't see much of a problem with lvl 1 fighter drones not being able to reliably engage high level hulls. I see these drones as being fairly fast to engage, fire many low-damage guided missiles, that are powerful against small and fast ships, then kamikaze them and die. Whereas, lvl2 bombers could be much slower, and fire powerful unguided (or limited guidance) torpedoes that do very heavy damage but much easier to dodge. and finally level3 could be a fighter-bomber with two powerful main guns (think semi-auto Gauss Cannons) that it uses to strafe heavy targets and small guided missiles that it uses against light targets. all-in-all I would definitely like to see them have more "presence" on the field....and not disappear after a couple of seconds. If that means that lvl1 drones have to be ineffective against heavy armor, so be it. As long as there's other alternatives to use against heavy armor. Huh. That does seem like a new bug. If you quit the game and then reload the save, does it reproduce? And true, with regards to the fighters not being able to engage heavy hulls. I just wouldn't want to go much under 20, is all, because at higher levels (once the final engineer tech tree is in, with the available boosts to armor) they'd have issues engaging even light fighter/interceptor hulls. It's actually why I had to change my rotary autocannons; I wanted them to be 20 shots/sec but the damage would have been around 10/shot which meant like 90% of the ships in the game were immune to them. I think I have the math up on how to get them to the sweet spot you mentioned, though; I'll toss up a build later tonight or tomorrow for people to try. Tech 1 (my v1.0) is almost set to launch, anyway. I did the bombers exactly like you mentioned, though. Fires two torpedos total after a longer initial interval than the fighters, much slower but still with limited guidance. The heavy fighter-bombers I'll have to tinker with; I love the idea but having fixed weapons on them seems bring a lot of design issues to light given how I produced the fighter effect in the first place. Actually having them as NPCs would make that idea sweet as hell, though, since you could actually set them up either for strafe runs or to establish an orbit on slower things while pounding away with guns. At that point, though, I think I'd have to name the bay the CRB-130 'Spectre'. Perhaps the solution to this is to separate fighters and bombers into separate bays? Have a "Fighter Drone" bay with fast and agile fighters that are used to engage light targets but are almost useless against heavy armor. and then a "Bomber Drone" bay that has powerful but slow bombers that are good against heavy targets, but almost useless against light targets. I actually thought about that, but I also wanted to keep the total number of weapons fairly low, if just for the purposes of balancing. Came up with a solution based on some of the things you said, though, along with the basic weapon premise in BTC that heavier weapons are slightly higher DPS but more important are higher burst/raw damage with longer cooldown. Ergo, the light shots should be on the small weapons, and the big booms should be in the large slots. So I retinkered a bit and made the light bay into essentially gunfighters with enough project speed that they can still reliably engage light targets. Fast ROF, but a low damage, will have issues with heavy armor. Medium-sized bay launches the missile interceptors with slower shots but enough damage to still be effective even against endgame light ships. Heavy bays now launch the bombers with limited-guidance torpedos for engaging large, slow targets with heavy armor. Then, once I have the tech in place and I'm ready to proceed on them... I figured if there's a place where multi-launch would be suitable, it'd be my capital spinal mounts; basically a flight deck along the hull of the ship, able to launch much larger waves in one huge burst. It'd be a unique twist on the 'superweapon' thought. All new graphics for a ton of stuff. Tech tree is 90% done. The only bits to add after I've had more time to balance are the 2nd tab of the defenses tree, for armoring, and the 2nd tab of the engineering tree. I haven't decided completely on that one, it'll either be the industrial tree or, if I can find someone willing to help with making mining/trading more robust or incorporate an outside mod, it'll be the generic-engineering tree and the mining will go to the social/industrial tab. Other areas should be fully fleshed out now, though balance tweaks will be coming. New hulls in the game. All variants of the Athena, Apollo, Hephaestus, Ares, Dionysus and Artemis are now in, as is the basic civilian version of the Hera heavy cruiser. All tier-I tech should be in the game now. This includes 2 engine strains, 2 RCS strains, 2 radar strains, 3 power plant strains and 3 shield strains. The remainder of the Hera hulls, as well as the frigate-size cargo ship and the Poseidon tanking hull. Some baseline booster modules reintroduced into the mix. And, as always, some screenies for Lurler. Combat page of the new tech tree. I really like how the icons are shaping up now. Mini-Avalanche and mini-Banshee fighters launch to engage the enemy. You can even see a few of their missile and railgun shots. P.S. I would recommend not trying the Hera hull until you have some better engines/RCS and movement skills. It's even worse than the old Hammer hulls without any sort of tweaks and it will take you a looooooong time to travel around.